As we all know, Patrice Evra has faced with a horde of criticisms regarding his performances last season. Fans have lamented his defensive capabilities, with the increasing feeling that he was not the player he once was. Some blame it on the racism storm with Luis Suarez; others point the finger at his complacency at being the only recognized and reliable left back for Manchester United; while a few would go as far as to attribute it to his problems with the French national team. However you see it, there is a growing voice that wants to see Evra being replaced and sold. 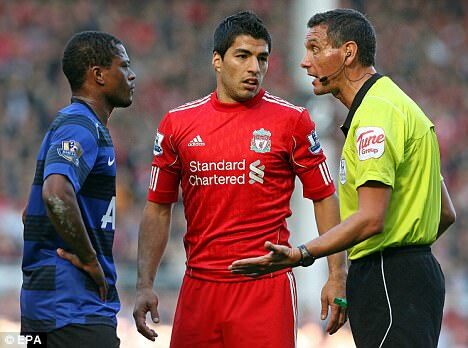 Did Evra's conflict with Suarez contribute to Evra's loss of form? But before we go to such an extent, let us take an in-depth look and find out just what is it about Evra’s performances that have created this voice of frustration among the United supporters. Firstly, I would like to compare Evra’s performance over the past 2 seasons (2010/2011 & 2011/2012) to see just how much his form has diminished. Following that, I would compare his performances with Ashley Cole (presumably England’s best left back) and Gaël Clichy (left back from Championship winning Manchester City last season), 2 well-thought-of Premier League left backs. Table 1 shows Evra’s performance over the past 2 seasons. Let us focus on the negatives first. From the table, we can see that the biggest drop in performance for Evra in the 2011/2012 season would be the significantly lower number of interceptions he made (54 VS 85). His percentage of aerial 50-50 wins also decreased (55% VS 63%), and he loss possession more times than he did in the previous season (40 VS 30). This definitely gives the first hints at Evra’s loss of form. But before we go on and criticize, let us not forget the positives too. We can see that Evra made significantly more ground 50-50 challenges (319 VS 275) in the 2011/2012 season and had a better win percentage in those challenges as well (61% VS 50%). He also had a slightly better tackle ratio than the previous season (31 mins per tackle VS 37 mins per tackle). In addition, he made more accurate passes (1647 VS 1369) and had a better pass completion rate (83.60% VS 80.29%). One of the biggest improvements was the number of successful dribbles in the 2011/2012 season, which was almost double of the 2010/2011 season (51 VS 26)! Finally, he created more chances too in the 2011/2012 season than the 2010/2011 season (40 VS 34). 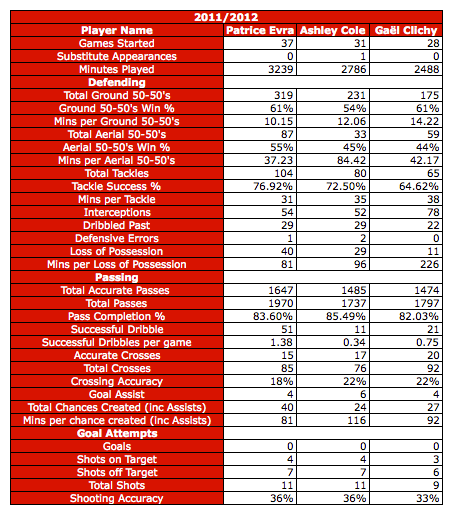 Table 2 shows Evra’s performance in comparison to Ashley Cole and Gaël Clichy. Similar to his comparison with the previous season, the most negative statistic towards Evra we can see is the number of times he loses possession (40 VS Cole’s 29 & Clichy’s 11). At this level, it is a rather poor statistic for a player from a top club to be losing possession almost once every game (81 mins per loss of possession). That aside, there is nothing much more we can criticize Evra for! In fact, it is quite the opposite. Firstly, he made significantly more ground 50-50 challenges (almost 90 more tackles than his closest competitor Cole) than the other 2. He also made more aerial 50-50 challenges (almost 30 more than closest competitor Clichy) and has a better aerial percentage win as well, considering his comparatively shorter nature (he won 55% of aerial 50-50’s). Following that, he made more tackles than either of the players (104 tackles to Cole’s 80 and Clichy’s 65) and had the better tackle success rate among the 3 players (76.92%). In addition, Evra made the most successful dribbles, with a whopping 51 dribbles, compared to Cole’s 11 dribbles and Clichy’s 21 dribbles. Finally, as an added incentive for a defender, Evra created the most chances for his team as well (40 chances VS Cole’s 24 & Clichy’s 27). 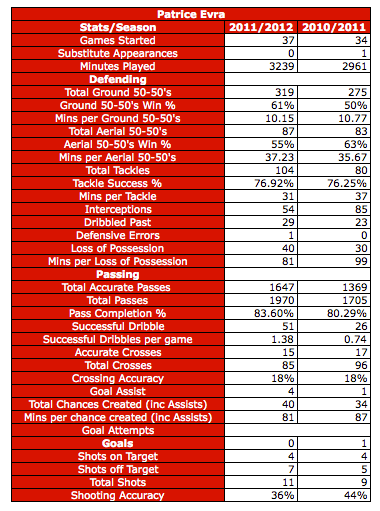 From these comparisons, numerically speaking, the statistics show that there is more good about Evra than bad. He has improved in various aspects of his game as compared to the previous season, such as his passing and his ability to create chances. In addition, most of his statistics show him to be far superior to his rival players. Evra's form might have dipped, but he is nowhere near as bad as people have suggested. However, this in no way discounts his limitations. It seems the biggest problem for Evra, and the main reason behind his supposed loss of form, is the significant increase in the number of times he loses possession last season. A less obvious reason would be his lower rate of interceptions as compared to the previous season, as well as relative to the other players. Cole had 52 interceptions, 2 less than Evra, but we must note that Cole played 5 fewer games than him. Clichy, despite playing the least number of games among the 3, had the most interceptions with 78. Add this to all the non-statistical observations, such as the times he lacked concentration and got caught out of position; it fits in nicely to be United’s scapegoat whenever something goes wrong. But my main point is this: while Evra’s form has evidently dipped, he is nowhere near as bad as people have suggested. The heavy criticism is likely because people have been accustomed to such a high level of performance from him over the years. His statistics, though, does not fully prove that he is a player who is deemed to be past his prime. Whatever it is, it would be interesting to see how he performs this season, especially being the only recognized left back for United (for the moment). In any case, this season would be a defining one for Evra. All of the stats from this article have been taken from the Opta Stats Centre at EPLIndex.com – Subscribe Now (Includes author privileges!) Check out our new Top Stats feature on the Stats Centre which allows you to compare all players in the league & read about new additions to the stats centre. Categories: Chelsea (NN), EPL Index Featured Article, EPL Index Player Profiles, EPL Index Statistical Comparisons, Manchester City (NN), and Manchester Utd (NN).' 'Tags: "Manchester United", CFC, Chelsea (NN), Clichy, Clichy Stats, Cole, Cole Stats, Demise of Evra, EPL, epl opta stats, EPL Stats, Evra, Evra Stats, left back, Manchester City, MCFC, MUFC, MUFC Stats, Opta Stats, and Patrice Evra Stats.